If the excitement of this young season has an exclamation point, it has to be the Curley Flying Lions jumping out on top of the standings. They’ve taken down all comers, and seen some heretofore dormant competitors come to life. Case in point is Madhouf Boursiquot. Here is an 8th grader who has attended Tenacity programs throughout his middle school years, but has waited until his 8th grade year to become an impact player in the league. 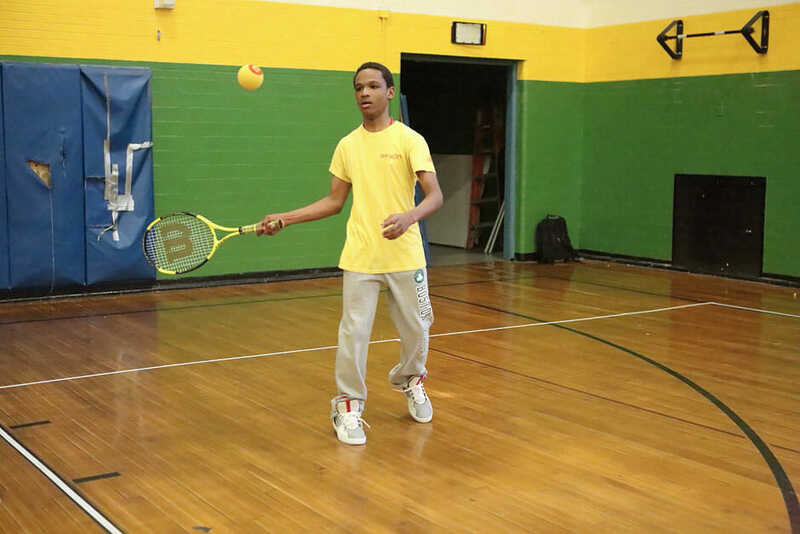 In his most recent match against the up-and-coming Irving Warriors, Madhouf and his partner, Jeremiah Sanchez, bounced back from a 6-2 deficit to defeat 8th graders Angel Vega and Erick Zhanay. Facing adversity, Bourisquot and Sanchez switched their strategy and made one of the most heroic comebacks in recent MSTL history. They won the match 8-6. Madhouf, along with Stiven Birenbaum, Katherine Arauz, Amber Solo, and Alex Castaneda have stepped up for their team this year. With the veteran leadership of Rain Twohads, who also scored a big win against the Irving, and Nayshawn Niles, the Curley has emerged as the team to beat in this young season. In second place are the Mario Umana Academy Eagles. Since losing their season opener to the Curley, the Eagles have been on a rampage. They beat the McCormack 15-6 with Robert Kubinec and Diego Acuna both notching wins in singles. Then they beat the Frederick, 15-5 with Perla Ortiz and Angel Gomez leading the way in that one. Some folks around the league are wondering why we haven’t seen names like Ana Ventura, John Le, or Gabriel Soriano listed in the box scores of the Umana matches. What might Coach Mike Dolph have up his sleeve? Try as one might, it’s hard to glean what Dolph’s strategy might be. Perhaps some of these familiar names will be representing the squad in their next match against the Irving. Regardless of who’s in the lineup, the entire Umana roster is working diligently to reclaim their top spot. Few in the East Boston community have forgotten the hollow feeling at last year’s Crane Cup, and that is no doubt motivating the squad to push themselves day in and day out. There may be a depth of talent over at the Umana, but they’ll need to be firing on all cylinders if they want to turn that potential into championships. This year the Washington Irving Warriors have become the media darlings of the MSTL, and they have not disappointed in the early goings of this season. They competed hard against the Curley, taking a narrow 21-19 defeat, and they showed toughness in pulling out a 17-15 win against the McCormack. The Irving’s loss to the Curley was one of the best matches of the season. Both teams brought some of their best players to this contest, and all matches were close. Irving 8th grader Shakeem Richards lost a tough one to the Curley’s Rain Twohads, 8-5. At first doubles was the aforementioned comeback by Madyuf and Jeremiah over 8th graders Angel Vega and Erick Zhanay, 8-6. And at second doubles, the Irving’s Rafael Diaz and Joe Palomin took down Curley’s Katerine Arauz and Amber Solo, 8-5. The total game score ended 21-19 in favor of the Curley, but the Irving sent shockwaves that have reverberated throughout the league with the statement they made in that match. Make no mistake, the Irving Warriors have come of age, and they are ready to rumble with the best the MSTL has to offer. The John D. McCormack Panthers have battled hard this season despite not having a check in the win column just yet. In their October 12 match with the Irving, for example, Roberto Murcia took down Damian Palomin, 4-2. In doubles, Jomar Baez and Dan Justiniano scored an impressive 4-2 win, and Joshua Serrano and Emmanuel George also won their match, 4-1. Clearly the Panthers held their own against the Irving even if they lost the match by a total game score of 17-15. Another reason for optimism is 8th grader Endy Ventura’s strong result against one of the league’s best players, the Umana’s Robert Kubinec. Ventura battled Kubinec to a tie-breaker, which he lost 7-5. The McCormack has proven they can hang with the MSTL’s best, but their biggest challenge lies ahead of them when they travel on November 8th to the Curley’s Lion’s Den. No one has emerged victorious from that forbidding arena. The Panthers hope to play the role of spoiler and throw a wrench into the Curley’s perfect season. A win in the Den would certainly turn the current standings on their head. The Frederick Panthers have gotten off to a slow start this season, losing their first two matches. It doesn’t help matters that they only get to play tennis twice a week for about 45 each time. That’s 90 minutes a week if you’re counting, which pales in comparison to other teams in the league. With that in mind, Coach Eglis is taking advantage of every second he and his team have on the courts and building the type of team chemistry that will lead to better results in the future. An example of that positive momentum is Jade Moses’ and Jayvon Fuquay’s 4-3 win over the Umana’s Amy Pol and Jose Gutierrez. As a team, the Frederick lost this one 15-5, but Moses and Fuquay showed the winning spirit that the Frederick hopes to build on. With two matches remaining in their regular season, the Panthers have plenty of opportunities to earn some wins and get moving in the right direction leading into the holiday tournaments. They’ll have to make the most out of every minute on the court in order to do it, but stranger things have happened in the MSTL.